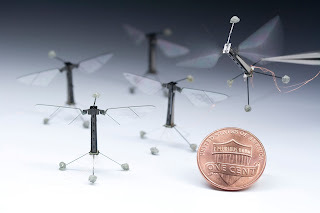 Engineers at the Harvard School of Engineering and Applied Sciences have developed a tiny robot insect, the size of a penny, that has the ability of controlled flight. The RoboBee, as it is called, weighs around 80 milligrams and has a wingspan of 3 centimeters. The RoboBees project as it is called aims to develop technologies that can open up advances in robotics, nanoscience and micromanufacturing. One of the goals of the project is to see how to build smaller power sources or batteries as well as designing efficient control systems. The RoboBee has the ability of controlled flight and can even hover around an area and move laterally in any direction. It is inspired by the biological structure of a fly with submillimeter-scale anatomy and two wafer-thin wings. The wings beat at 120 times a second making the wings invisible to the eye when flapping. Another aspect of the RoboBee is the materials it is made up of; plastic, lightweight carbon fiber and ceramic. 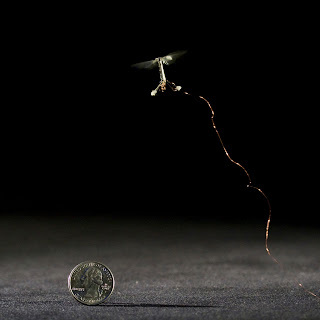 The project is still in its early stages but engineers are now looking into further evolving the technology enabling the tiny robot insects to move autonomously, be self-powered, and have tiny computer brains. With the combination of biology, design engineering, materials engineering, and computer technology, the RoboBee can be used in the future for various applications such as search and rescue, environmental monitoring, and even be used in crop pollination. It can also lead into the development of other tiny robots that can be used in other fields such as in medicine and exploration.